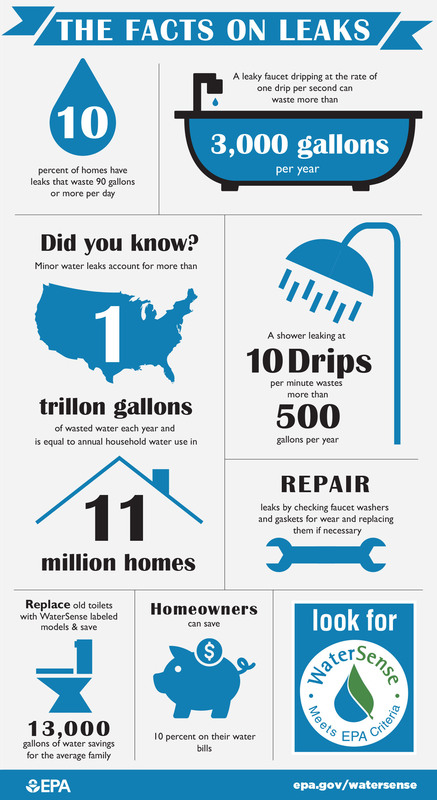 If you think the tiny drip from your bathroom faucet doesn’t really waste all that much water, think again. Leaks in the average American home account for about 10,000 gallons a year – or about 12 percent of your annual water bill. That’s enough water for 270 loads of laundry. What happens when you combine your small drips with billions of leaks across the country? According to the U.S. Environmental Protection Agency, leaks waste more than 1 trillion gallons of water in the United States each year. A 1 followed by 12 zeros is a pretty large number, right? Put it this way: Texas is roughly 270,000 square miles. One trillion square miles would equal 3.7 million Texas-sized states. Still don’t think every drop counts?